Create a new Selector by right-clicking the Selectors folder and choosing New Selector. When finished, the Selector Editor will open in a new Tab. You can also open the editor at any time by double clicking a Selector in the Selector folder. The six available keywords are listed in the Selector Editor where you can click any keyword to open a comprehensive list of all properties. 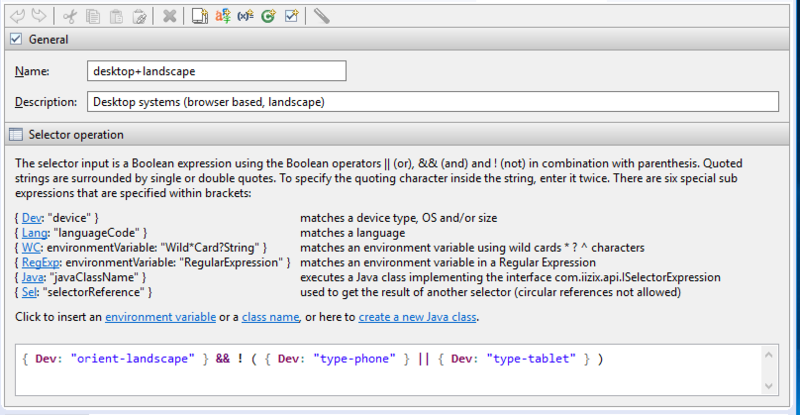 The editor writes iizi Selector Expressions and you choose from the available properties. The Selector Editor has toolbar that allows you to define an input device to test against your new expression. The default input device is the last device connected to iiziGo. The editor instantly tells you if your expression finds or fails to find the device. The selector editor and its toolbar with example of an iizi selector expression.